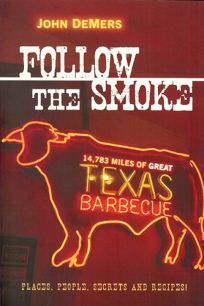 After a gut-busting tour of seemingly every mom-and-pop barbecue joint in the state of Texas, veteran author DeMers (The Food of New Orleans) has produced a definitive state guide to independent 'cuers, divided by region (east, north, central, etc.). Since it's Texas, beef brisket features prominently, though methods of preparation (dry rub, choice of wood, time on the smoker, etc.) vary intriguingly. Choice menu items and contact information are provided, but DeMer's focus is on the characters who make it happen: Eric Hilliard and the Hackleman brothers of Smokey Joe's in Nash believe the Lord Himself wanted them to enter the business; trained chef Wayne Anderson ditched 30 years of country-wide kitchen work for a battered baseball hat and a barbecue pit in Marble Falls; and WWII veteran Vencil Mares, proprietor of the Taylor Cafe for over 50 years, who has trained no successor to keep Texans in his brisket, named one of the 20 best dishes in America by USA Today. A handful of recipes round out this thorough travel guide; readers on the trail of Texas culinary gold should find it as indispensable as a map. Color photos.